Making money from making money from public phone charging in nigeria is one of he local business that many Nigerians neglect, but not this hausa man who shared how much he earns monthly from the business. 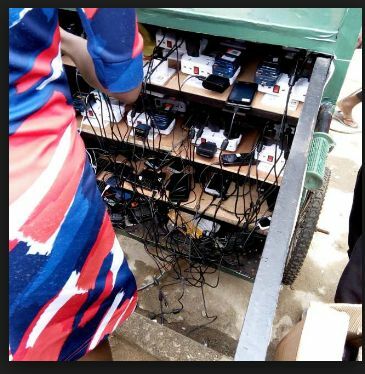 A middle-aged man, who has been identified as Ibrahim Usman, who own a place where he charges handset in Lafia, says he makes N180,000 monthly on phone-charging business, using I pass my neighbour generator and solar energy. “I took advantage of the irregular provision of electricity in Lafia and makes N180,000 monthly,” Usman told the News agency of Nigeria (NAN) in Lafia on Saturday. According to him, charging of phones and several other electrical accessories has being a source of income and it has also put food on my table and cash in my bank account. “Although, i’m not happy that there’s irregular electricity provision in Lafia, I will say that has been to my advantage currently. Usman appreciated his customers, even as he advised the youth not to always wait on the government for jobs.